It’s widely acknowledged that fishing is far better when you’re drinking beer. Believe us, you don’t have to be a hillbilly in a lawn chair sipping a Coors with your fishing line dangling in the water unattended. Drinking beer and fishing in Alaska is a little more sophisticated and a little more savory as an experience. If you close your eyes and breathe deeply, you’ll smell that tang of the salty sea, you’ll feel the gentle rocking of the boat as the waves of that steely blue, cold water lap at the hull and in your hand is a bottle of delicious craft beer made right here in Alaska. 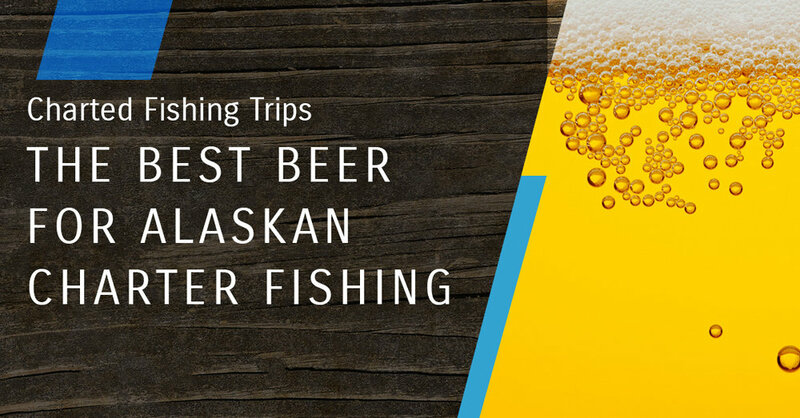 The pairing of craft beer and charter fishing is natural, as both are focused on the Alaskan experience and sharing the magic and adventure of our land. Beyond the essentials — a fishing rod and bait, all of the items you should bring on board while fishing may be unclear. A great snack is a good idea, especially for all-day fishing trips, where you’ll be enjoying the scenery, the lull of the waters, and the smell of the sea while fishing. Be sure to bring healthy options full of both proteins and carbs so you don’t get hangry while on board and take it out on your crew. All jokes aside, staying hydrated and keeping food in your belly will lead to a much better time, and you’ll be able to sip your beer easier. When you get out to the open water and you’re surrounded by sharp cliffs and shorelines full of blended natural hues, it’ll be nice to sit back with a beer between the tug-of-war you’ll have with each of those monstrous salmon and rockfish you’ll pull on deck. Which brews should you choose to pair with your experience? What about craft beer from the Last Frontier to complement your adventure? Although our prohibition was only recently repealed, we have many delicious breweries that distribute to the surrounding areas for people to enjoy. You’ve probably seen them in stores around the United States as they have a pretty far distribution radius. Their classic Amber is a delicious and full-bodied alternative to a stout or a porter. It’s malty without being overpowering and is a great choice for folks who aren’t used to craft beer yet. If you love a hoppy IPA however, you’ll really enjoy the Smash Galaxy IPA with the savory bitterness you’d expect in an IPA, but with the added bonus of passion fruit undertones. If you like sours or a fruity sweetness in your brews, this is the brewery for you. The Palmer, Alaska based brewery produces several delicious blondes with different berry flavors. They feature a Berry-Go-Round series with a raspberry blonde, a blueberry blonde and an unusual cranberry blonde. If you’re wanting to match the chilly yet crisp air, and you’re looking for something closer to a winter stout beer, be sure to check out their Lava Mountain Russian Imperial Stout. With a hefty 8 percent alcohol content, this savory beer is perfect for slow drinking with a hoppy finish and roasty undertones. Alaska has more to offer than breathtaking natural splendor. If you’re intrigued by our big game fishing and craft beer, contact J-Dock. Be sure to catch our next blog for more featured brews from the Last Frontier. We’re waiting to forge the experience you’ve been waiting for.